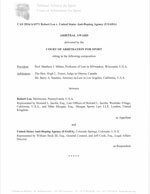 USADA announced today that a three-member panel of the Court of Arbitration for Sport (CAS) based in Lausanne, Switzerland, rendered its decision in the appeal, filed by cyclist Bobby Lea, of an earlier American Arbitration Association (AAA) arbitration award finding Lea committed an anti-doping rule violation. The CAS Panel confirmed Lea’s anti-doping rule violation while shortening his period of ineligibility from 16 months to six months. The CAS Panel also upheld the start date for Lea’s period of ineligibility, confirming that his sanction should commence from September 10, 2015, the date on which he accepted his provisional suspension. As a consequence of the CAS Panel decision, Lea will be eligible to compete again on March 10, 2016. Further, as a result of the doping violation, Lea has also been disqualified from all competitive results achieved on August 8, 2015 at the Elite & Junior Track National Championships and on and subsequent to the date in which the provisional sanction was accepted, including forfeiture of any medals, points, and prizes. 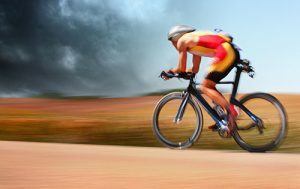 Lea, 32, of Topton, Penn., provided a urine sample on August 8, 2015, at the Elite & Junior Track National Championships competition held August 3-8, 2015, in Carson, Calif. His sample resulted in an Adverse Analytical Finding for noroxycodone, which is a metabolite of oxycodone. Oxycodone is listed as a specified prohibited substance in the class of narcotics on the World Anti‐Doping Agency (“WADA”) Prohibited List, which has been adopted by the USADA Protocol for Olympic and Paralympic Movement Testing and the rules of the International Cycling Union (UCI).